I just realized this is my 500 post. I don't think they are all published anymore -- some of them were from posts I did to earn a little extra scratch -- but still...500! Yowsers. 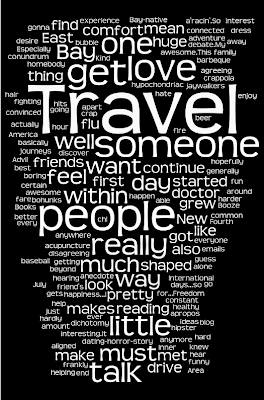 I found this cool thing from Wordle. Head in Knots, in black and white. That Wordle things is really cool, Annie. However, much more cool is that you've reached 500 posts. As someone who's struggling to top 20 of them, that's certainly an awesome milestone. Hence, congrats!